1957 Kay Quattrocchi was born in Africa and moved to Vietnam with her family when she was 9 months old. 1957 - 1968 She grew up in Saigon during the Vietnam war. Her father was an engineer and her mother an art teacher. She spent her first years of schooling at the Regina Mundi School, "Les Oiseaux" in Saigon. 1970 - 1971 Ceylon, Sri Lanka. 1972 - 1973 Congo, Brazzaville. 1978 Kay sailed on the legendary "Kriter"with Captain Pierre Daboussy and his best friend Alain Gliksmann. They travelled to St Martin, Açores, Gibraltar, Ibiza, Sicile, Tunisie, Grece, Rhodos with Tahiti as the final destination. 1983 - 1988 Kay Quattrocchi traveled and did many exhibitions in such countries as Paraguay, Isla de Pasqua, New Zealand, Australia, Japan, and Tahiti. For two years she was the creator and presenter of a program for the French TV, during which time she performed in two movies. She completed many drawings that depicted Polynesian traditions such as tattoos, dance, etc., and met with Paul Emile Victor who was her hero as a young girl and with whom she made exhibitions. She also met with Joel Blanchard who was a student of Dali and became her tutor during two years. 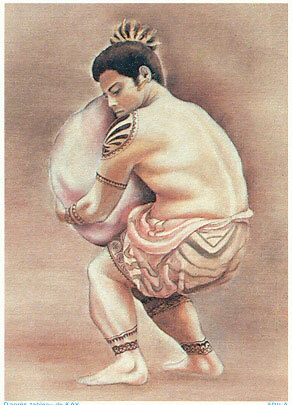 1988 The Polynesian government and the experts in the art of stamps from the French Post Offices chose one of her works to be presented in the international philatelic collection: the “Stone Carrier” exhibited at Paris’ Porte de Versailles. 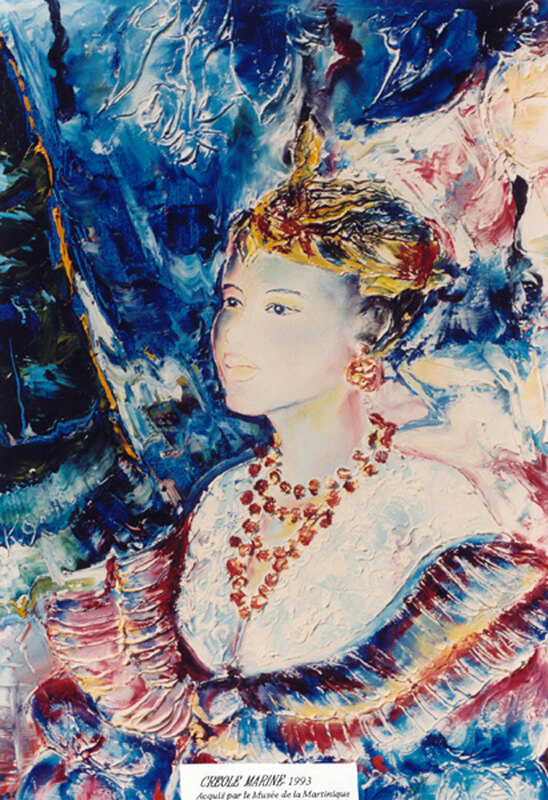 1989 For the bicentenary of the revolution, Kay Quattrocchi creates the “Marianne of the DOM TOM,” acquired by the president of Martinique’s local council who offered lithographies to Mr François Mitterrand and Mr Jacques Chirac. The “Marianne of the DOM TOM” was presented to the French television along with a song with 40 voices created by Kay Quattrocchi and harmonized by Mr Laouchez. 1990 The "Creole Marine" was acquired by the Museum of Martinique. 1991 Autumn Salon in Paris. 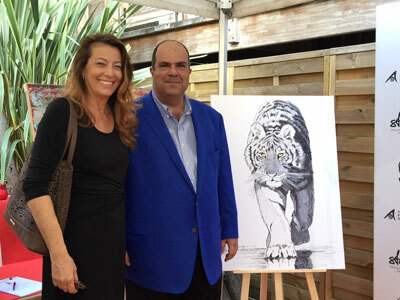 Kay Quattrocchi meets with Michael Turovsky who tought her the technique of figure-abstraction. This, she says, was a great experience. 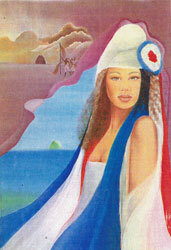 1993 Her arrival in Saint Barthelemy, French West Indies. 1994 She created her gallery "Espace 21" and worked with “Maitre Pierre Cornette de Saint-Cyr” on an exhibition of Modigliani, Picasso, Arman, Cesar, Leonor Fini, Chemiakin, Raoul Dufy, Marie Laurencin, and herself. She met at the time a very good friend of Madame Hillary Roddham Clinton and carried out a special commissioned order for a portrait of Madame Clinton. 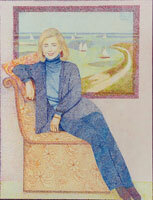 From this moment on, she painted many portraits using the pointillism technique. 2000 She sold her gallery and painted for the stars and top models such as Izabelle Scorupco, Jeff Goldblum, and many others. 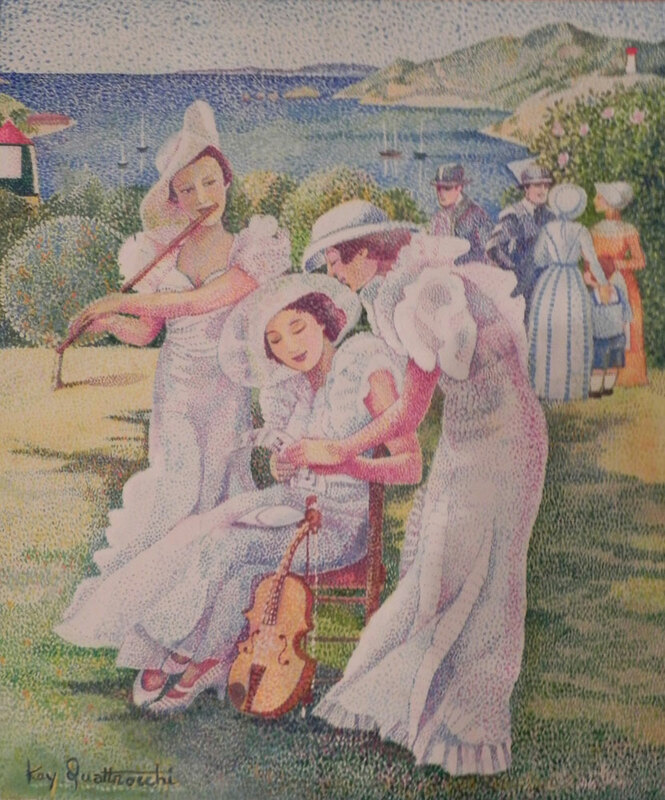 2003 The poster of the festival of music of St. Barthelemy was carried out in pointillism and the painting sold at auction for the benefit of the Festival. 2001 - 2016 She creates sculptures and paintings for many private collectors.